Viable cheaper 3D screen that delivers where it counts. Two dimensions might have been fine for the last few thousand years of great philosophy works, Shakespeare folios and Kubrick masterpieces, but it's just so… you know… flat. We're living in a post-Avatar world, and thus everything in life should be popping out at you all the time. Imagine if you were reading these words on one of those new 120Hz 3D monitors. Mindblowing, right? Well, the jury's out on the actual merit of the 3D PC experience, but if you see this extra dimension in entertainment as the way of the future, you'll need to invest in a monitor that can handle the refresh rates required for such eye-popping visual trickery. We've already seen some quality panels burst onto the market (it looked like they were coming right at us), with the BenQ XL2410 and the Asus VG236 offering particularly good value and 3D prowess at £300 and £400 respectively. Hanns-G, not to be outdone, has produced a similar 23-incher for just £280. An intriguing prospect, no? The Asus' price does include the Nvidia 3D Vision kit required for 3D gaming visuals, though, so the £280 you'll shell out for the HS233 must be complemented with a further £120 flying out of your wallet for the 3D specs. With its skinny price tag in mind, it's actually quite a similar screen to those already on the market. From the 3ms response time and 1,920 x 1,080 native resolution to the 1,000:1 contrast ratio, the HS233 is able to match its competitors pace for pace in terms of its build and picture quality. However, the BenQ can be swivelled around to a portrait format and offers especially good colour definition, while the Asus takes the pain and hassle out of buying the 3D Vision kit by bunging it in one package with the screen. Hanns-G's 3D offering has no unique selling point like those two; it's simply a 3D-capable panel for a slightly cheaper price than the competition. The question is, does choosing the cheaper option mean any significant sacrifice? Disregarding the 3D stuff for a second, as a gaming/media monitor it performs admirably. Picture and colour quality is crisp if not Earth-shattering – no washed-out visuals here. It sits a little flimsy on the desk and isn't exactly yogic in its flexibility, but only owners of extremely cluttered desks will find the HS233 incapable of manoeuvring into a usable position. So, you have a decent 23-inch screen sitting on your desk. It cost you £280. You're really counting on the 3D performance to make it worth your while. It should be noted that considerable faffing around and driver updating/deleting can be required to get the 3D Vision kit working. It's not Hanns-G's fault, but it does outline the major problem in 3D gaming: the fuss. The HS233 produces 3D images of the same calibre as the more costly Asus and BenQ panels and adds another level of immersion with a game or movie, just as the others do, but it's up to the user to decide if that's worth coping with the torturously painful glasses. 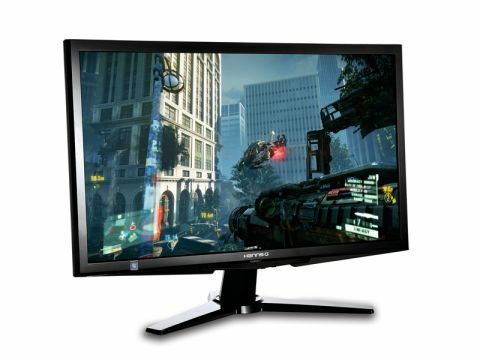 The Hanns.G HS233 is a very capable 3D monitor at a very reasonable price-point. And thanks to that 120MHz refresh rate it's also one hell of a good all-round monitor, too. It's also backlit, giving vivid colour representation and crystal clear images. That reasonable price-point, though, unlike the competing Asus screen, doesn't include the Nvidia 3D Vision kit. That itself costs another £100, so if you're after the full 3D package you've got to pay.